I’ve come to realize that we don’t celebrate life enough. Why do we wait for the “special occasions” to break out a bottle of bubbly? Isn’t every day a miracle and an excuse to celebrate? I have a co-worker who has been out on long term disability for nearly a year. At the age of 32 she had a massive brain aneurism that altered her life forever. Her husband and two small children have rallied around their wife and mom but life isn’t the same. She was getting ready to come back to the team this month but I recently learned that she “took a turn for the worse” and will probably never come back. While I was at music practice at church, one of the singers shared that her mother-in-law’s house burned to the ground last week. They lost everything and are now scrambling to put the pieces of their lives back together. A day that we are alive, healthy and with those we love is a day to celebrate. Everyone needs a little more sparkle in their life. To this, I say, let’s get it poppin’ – the corks that is! My Twitter friend (I hope I can call him friend) Dale Cruse is on a mission to drink bubbly every day for a year. More than 3 months into his quest, he is still going strong. I encourage you to take a break from your routine and join the world wide celebration on Friday, October 28. Together, we’ll pop the cork on thousands of bottles of Champagne to celebrate…LIFE! My good bud, Chris O (trust me, just O because you can’t pronounce his last name), is hosting the event and participation is as simple as 1, 2, 3. Register at http://champagne-day.eventbrite.com – This keeps you in the loop of all the latest happenings and event update. Pop your cork on some “real” Champagne (I’ll explain later) and talk about it with millions of people (well at least 1 or 2) on Twitter or Facebook. To keep up on the Twitter machines use the hashtag #champagne. To go “old school” on Facebook you can use the Taste and Tweet page. See how easy that is! Why wouldn’t you want to pop your cork? Friday October 28, 2011 ALL DAY! This is a Champagne day celebration. While many people make sparkling wine, only the French can make Champagne…to be precise only wine that comes out of Champagne, France can be called Champagne. While it might sound like French snobbery to some, they developed the process, so I think they deserve to lay claim to the name. Check out the history of Champagne and how they make it from our super cool all knowing friends at Wikipedia! As I mentioned at the beginning of this article, every day is worth celebrating. What do you have to celebrate? Let’s try something cool, I would love to hear what deserves some sparkle in your life. Did you get a new job? Are your children succeeding in school? Did your teenage son actually smile? Let’s celebrate together. Leave a comment so we can all be inspired. See you on October 28 for a massive cork pop! For inspiration, check out this video! Great post Josh! I totally agree and my guest post on Why I Love Bubbly will follow in the next week. How fun…thanks for sharing this. That vid is just sick! Love it. can not wait for this, if there’s one thing I love almost as much as Austrian wine it’s Champagne – In fact, I’m going to have some tonight! Thanks for helping promote the champagne day event! Keep up the awesome work. Can I just say, nice photo. Those strawberries look mighty tasty. 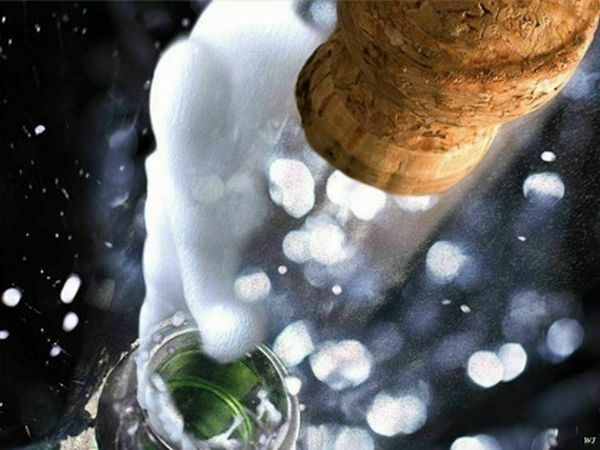 Raising a glass of bubbles to you on your 300th post!! Ok, I lied, I’m drinking a lovely Pinot Noir Rosato, but raising my glass to you nonetheless. I figured you’d like that! When I saw it, I just couldn’t resist. I love strawberries. Thanks for your support over the last 300 posts and keep pressing on at the new gig! We are so on this. I have some champagme cocktails planned and will be picking up a couple of good bottles that we wouldn’t normally have around! I’m sorry but the map you use for champagne and so many wine area in France is wrong.